North Carolina is a state located on the Atlantic Seaboard in the southeastern United States. It was one of the original Thirteen Colonies that declared their independence from Great Britain, and seceded from the Union during the American Civil War. The state's Native American population was included in the 1838 forced relocation to Indian Territory (now Oklahoma) known as the Trail of Tears. Today North Carolina has the largest population—over 110,000 in the early twenty-first century—of American Indians of any state east of the Mississippi River and recognizes eight Native American tribes. 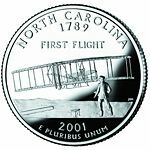 North Carolina was the location of the first successful controlled, powered and sustained heavier-than-air flight, by the Wright brothers near Kitty Hawk in 1903. Today, it is a fast-growing state with an increasingly diverse economy and population. The Great Smoky Mountains National Park, which encompasses over 800 square miles in the Southern Appalachian Mountains, is home to at least 10,000 species, though scientists believe an additional 90,000 species may live there. No other area of equal size in a temperate climate can match the park's amazing diversity of plants, animals, and invertebrates. It is the most heavily visited national park in the United States. 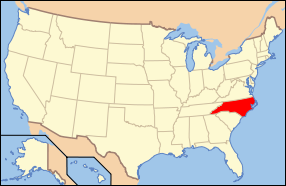 North Carolina is bordered by South Carolina on the south, Georgia on the southwest, Tennessee on the west, Virginia on the north, and the Atlantic Ocean on the east. North Carolina consists of three main geographic sections: the coastal plain, which occupies the eastern 45 percent of the state; the Piedmont region, which contains the middle 35 percent; and the Appalachian Mountains and foothills. The extreme eastern section of the state contains the Outer Banks, a string of sandy, narrow islands that form a barrier between the Atlantic Ocean and inland waterways. The Outer Banks form two sounds—Albemarle Sound in the north and Pamlico Sound in the south. They are the two largest landlocked sounds in the United States. Immediately inland, the coastal plain is relatively flat, with rich soils ideal for growing tobacco, soybeans, melons, and cotton. The coastal plain is North Carolina's most rural section, with few large towns or cities. Agriculture remains an important industry. The Piedmont is the state's most urbanized and densely populated section; all five of the state's largest cities are located there. It consists of gently rolling countryside broken by hills or low mountain ridges. A number of small, isolated, and deeply eroded mountain ranges and peaks are located in the Piedmont, which ranges from about 300–400 feet (90–120 m) elevation in the east to over 1,000 feet (300 m) in the west. Due to the rapid population growth of the Piedmont, many of the farms and much of the rural countryside in this region are being replaced by suburbanization: shopping centers, housing developments, and large corporate office parks. The western section of the state is part of the Appalachian Mountain range. Among the subranges of the Appalachians located in the state are the Great Smoky Mountains, Blue Ridge Mountains, Great Balsam Mountains, Pisgah Mountains, and the Black Mountains. The Black Mountains, the highest in the Eastern United States, culminate in Mount Mitchell at 6,684 feet (2,037 m)., which is the highest point east of the Mississippi River. At 6,684 feet, Mount Mitchell is the highest point in the U.S. East of the Mississippi River. Although agriculture remains important, tourism has become the dominant industry in the mountains. Renowned for its diversity of plant and animal life, the beauty of its mountains, and its remnants of Southern Appalachian mountain culture, Great Smoky Mountains National Park is America’s most visited national park. One agricultural pursuit that has prospered and grown in recent decades is the growing and selling of Christmas trees. Due to the higher altitude of the mountains, the climate often differs markedly from the rest of the state. The coastal plain is influenced by the Atlantic Ocean, which keeps temperatures mild in winter and moderate in the summer. The Atlantic Ocean has less influence on the Piedmont region, and as a result the Piedmont has hotter summers and colder winters than the coast. Annual precipitation and humidity is lower in the Piedmont than either the mountains or the coast. The Appalachian Mountains are the coolest area of the state. Winters in western North Carolina typically feature significant snowfall and subfreezing temperatures more akin to a Midwestern state than a southern one. Relatively cool summers have temperatures rarely rising above 80 °F (26.7 °C). Severe weather occurs regularly in North Carolina. On average, the state receives a direct hit from a hurricane once a decade. Tropical storms arrive every three or four years. Only Florida and Louisiana are hit by hurricanes more often. In 1989 Hurricane Hugo caused heavy damage in Charlotte and even as far inland as the Blue Ridge Mountains. Stream within a Linville community. The Blue Ridge Mountains in the foreground with Grandfather Mountain in the extreme background as seen from Blowing Rock, NC. Bodie Island Lighthouse, one of the Outer Banks attractions. 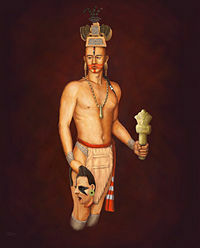 A Mississippian priest, with a ceremonial flint mace. Artist Herb Roe, based on a repousse copper plate. North Carolina was originally inhabited by many different native peoples, including those of the ancient Mississippian culture established by 1000 C.E. in the Piedmont. Historically documented tribes included Cherokee, Tuscarora, Cheraw, Pamlico, Meherrin, Coree, Machapunga, Cape Fear Indians, Waxhaw, Saponi, Tutelo, Waccamaw, Coharie, and Catawba. Spanish explorers traveling inland encountered the last of the Mississippian culture at Joara, near present-day Morganton. Records of Hernando de Soto attested to his meeting with them in 1540. In 1567 Captain Juan Pardo led an expedition into the interior of North Carolina. The expedition built six forts, which were destroyed by the Native Americans. The Spanish never returned to the interior to press their claim, but this marked the first European attempt at colonization of the interior of what became the United States. In 1584, Elizabeth I, granted a charter to Sir Walter Raleigh, for whom the state capital is named, for land in present-day North Carolina (then Virginia). Raleigh established two colonies on the coast in the late 1580s, both ending in failure. It was the second American territory the British attempted to colonize. The demise of the "Lost Colony" on Roanoke Island remains one of the great mysteries of American history. As early as 1650, colonists from the Virginia colony moved into the area of Albemarle Sound. By 1663, King Charles II of England granted a charter to establish a new colony, naming it Carolina in honor of his father Charles I. By 1665, a second charter was issued to attempt to resolve territorial questions. In 1710, due to disputes over governance, the Carolina colony began to split into North Carolina and South Carolina. The latter became a crown colony in 1729. The first permanent European settlers of North Carolina were British colonists who migrated south from Virginia, following a rapid growth of the colony and the subsequent shortage of available farmland. 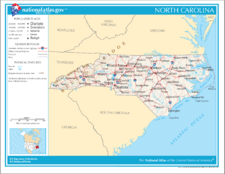 In 1712, North Carolina became a separate colony. During the Revolutionary War, the English and Highland Scots of eastern North Carolina tended to remain loyal to the British Crown, because of longstanding business and personal connections with Great Britain. The Scots-Irish and German settlers of western North Carolina tended to favor American independence from Britain. Most of the English colonists arrived as indentured servants, hiring themselves out as laborers for a fixed period to pay for their passage. In the early years the line between indentured servants and African slaves or laborers was fluid. Some Africans were allowed to earn their freedom before slavery became a lifelong status. As the flow of indentured laborers to the colony decreased with improving economic conditions in Great Britain, more slaves were imported. The economy's growth and prosperity came to be based on slave labor, devoted to the production of tobacco. On April 12, 1776, the colony became the first to instruct its delegates to the Continental Congress to vote for independence from the British. Throughout the Revolutionary War, fierce guerrilla warfare erupted between bands of pro-independence and pro-British colonists. A major American victory in the war took place at King's Mountain along the North Carolina–South Carolina border. Another key battle pitted the Americans' southern commander Nathanael Greene against British General Charles Cornwallis. The crippling British casualties at the hands of the numerically superior American army led Cornwallis to move to the Virginia coastline to get reinforcements and allow the Royal Navy to protect his battered army. This decision would result in his eventual defeat at Yorktown, Virginia later in 1781. The patriots' victory there guaranteed American independence. On November 21, 1789, North Carolina became the twelfth state to ratify the Constitution. Most of North Carolina's slave owners and large plantations were located in the eastern portion of the state. Although North Carolina's plantation system was smaller and less cohesive than those of Virginia, Georgia, or South Carolina, there were significant numbers of planters concentrated in the counties around the port cities of Wilmington and Edenton, as well as suburban planters around the cities of Raleigh, Charlotte, and Durham. Planters owning large estates wielded significant political and socio-economic power. There were a number of free people of color in the state, most of whom were descended from free African Americans who had migrated from Virginia during the eighteenth century. They were concentrated in the eastern coastal plain, especially at port cities such as Wilmington and New Bern where they had access to a variety of jobs. Free African Americans were allowed to vote until 1835, when the state rescinded their suffrage. After the Revolution, Quakers and Mennonites worked to persuade slaveholders to free their slaves. Enough were inspired by their efforts that the number of free people of color rose in the first couple of decades after the Revolution. While slaveholding was slightly less concentrated than in some Southern states, according to the 1860 census, more than 330,000 people, or 33 percent of the population of 992,622, were enslaved African Americans. The state did not vote to join the Confederacy until President Abraham Lincoln called on it to invade South Carolina, becoming the last state to join the Confederacy. North Carolina was the site of few battles, but it provided at least 125,000 troops to the Confederacy— far more than any other state. Approximately 40,000 of those troops never returned home, dying of disease, battlefield wounds, and starvation. Even after secession, some North Carolinians refused to support the Confederacy. This was particularly true of non-slave-owning farmers in the state's mountains and western Piedmont region. Some of these farmers remained neutral during the war, while some covertly supported the Union-cause during the conflict. The largest battle fought in North Carolina was at Bentonville, which was a futile attempt by Confederate General Joseph Johnston to slow Union General William Tecumseh Sherman's advance through the Carolinas in the spring of 1865. In April 1865 after losing the Battle of Morrisville, Johnston surrendered to Sherman at Bennett Place, in what is today Durham, North Carolina. This was the last major Confederate army to surrender. North Carolina's port city of Wilmington was the last Confederate port to fall to the Union, in the spring of 1865. During the Civil War the Wilmington-to-Raleigh railroad link would be vital to the Confederate war effort; supplies shipped into Wilmington would be moved by rail through Raleigh to the Confederate capital of Richmond, Virginia. According to the Bureau of Economic Analysis, the state's 2006 total gross state product was $375 billion. Its 2005 per capita personal income was $31,029, 36th in the nation. There has been a distinct difference in the economic growth of North Carolina's urban and rural areas. While large cities such as Charlotte, Raleigh, Greensboro, and others have experienced rapid population and economic growth over the last 30 years, many of the state's small towns have suffered from loss of jobs and population. Most of North Carolina's small towns historically developed around textile and furniture factories. As these factories closed and moved to low-wage markets in Asia and Latin America, the small towns that depended upon them have suffered. Over the past century, North Carolina has grown to become a national leader in agriculture, financial services, and manufacturing. The state's industrial output—mainly textiles, chemicals, electrical equipment, paper and pulp/paper products—ranked eighth in the nation in the early 1990s. The textile industry, which was once a mainstay of the state's economy, has been steadily losing jobs to producers in Latin America and Asia for the past 25 years, though the state remains the largest textile employer in the United States. Over the past few years, another important Carolina industry, furniture production, has also been hard hit by jobs moving to Asia (especially China). Tobacco, one of North Carolina's earliest sources of revenue, remains vital to the local economy, although concern about whether the federal government will continue to support subsidies for tobacco farmers has led some growers to switch to other crops like grapesfor wine or to leave farming altogether. North Carolina is the leading producer of tobacco in the country. Agriculture in the western counties of North Carolina is presently experiencing a revitalization coupled with a shift to niche marketing, fueled by the growing demand for organic and local products. Charlotte, North Carolina's largest city, continues to experience rapid growth, in large part due to the banking & finance industry. Charlotte is now the second largest banking center in the United States after New York City. The information and biotechnology industries have been steadily on the rise since the creation of the Research Triangle Park (RTP) in the 1950s. Located between Raleigh and Durham, its proximity to local research universities has no doubt helped to fuel growth. The North Carolina Research Campus underway in Kannapolis (approx. 30 miles (48 km) northeast of Charlotte) promises to enrich and bolster the Charlotte area in the same way that RTP changed the Raleigh-Durham region. Encompassing 5,800,000 square feet (540,000 m²), the complex is a collaborative project involving Duke University, University of North Carolina at Charlotte, University of North Carolina at Chapel Hill, and N.C. State University, along with private and corporate investors and developers. North Carolina State Capitol in Raleigh. North Carolina State Legislative Building. The governor, lieutenant governor, and eight elected executive department heads form the Council of State. Ten other executive department heads appointed by the governor form the North Carolina Cabinet. 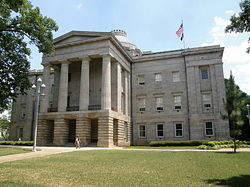 The North Carolina General Assembly consists of two houses: a 50-member Senate and a 120-member House of Representatives. The Supreme Court is the state's highest appellate court. North Carolina currently has 13 congressional districts, which, when combined with its two U.S. Senate seats, gives the state 15 electoral votes. Although once part of the "Solid Democratic South", by the mid-twentieth century Republicans began to attract white voters in North Carolina. The late Sen. Jesse Helms played a major role in turning North Carolina into a two-party state. Under his banner, many conservative white Democrats in the central and eastern parts of North Carolina began to vote Republican, at least in national elections. In part, this was due to dissatisfaction with the national Democratic Party's stance on issues of civil rights and racial integration. In later decades, conservatives rallied to Republicans over social issues such as prayer in school, gun rights, abortion rights, and gay rights. Except for regional son Jimmy Carter's election in 1976, from 1968–2004 North Carolina has voted Republican in every presidential election. At the state level, however, the Democrats still control most of the elected offices. Modern North Carolina politics center less around the old east-west geographical split and more on a growing urban-suburban-rural divide. Many of the state's rural and small-town areas are now heavily Republican, while growing urban centers such as Charlotte, Asheville, Raleigh, Durham, and Greensboro are increasingly Democratic. The suburban areas around the cities usually hold the power and vote both ways. North Carolina remains a state where alcohol is controlled. This is probably due to the state's strongly conservative Protestant heritage. Four of the state's counties - Clay, Graham, Mitchell, and Yancey, which are all located in rural areas - remain "dry" (the sale of alcoholic beverages is illegal). However, the remaining 96 North Carolina counties allow the sale and consumption of alcoholic beverages. Even in rural areas, the opposition to selling and drinking alcoholic beverages is declining. North Carolina is one of the 12 states to decriminalize marijuana. Transfer of less than five grams is not considered sale, and up to 1.5 ounces is a misdemeanor punishable by a fine or community service, at the judge's discretion, rather than imprisonment or a felony charge. According to the U.S. Census Bureau, as of 2006, North Carolina had an estimated population of 8,856,505, which was an increase of 184,046, or 2.1 percent, from the prior year and an increase of 810,014, or 10.0 percent, since the year 2000. This exceeds the rate of growth for the United States as a whole. Between 2005 and 2006, North Carolina passed New Jersey to become the 10th most populous state. In 2007, the U.S. Census Bureau estimated that the racial makeup of North Carolina was as follows: 70 percent white American, 25.3 percent African American, 1.2 percent Native American, and the remaining 6.5 percent Hispanic. North Carolina has historically been a rural state, with most of the population living on farms or in small towns. However, in the last quarter of the twentieth century the state has undergone rapid urbanization, and today most of North Carolina's residents live in urban and suburban areas. In particular, the cities of Charlotte and Raleigh have become major urban centers, with large, diverse, mainly affluent, and rapidly growing populations. Most of this growth in diversity has been fueled by immigrants from Latin America, India, and Southeast Asia. African Americans make up nearly a quarter of North Carolina's population. The number of middle-class blacks has increased since the 1970s. African Americans are concentrated in the state's eastern Coastal Plain and in parts of the Piedmont Plateau, where they had historically worked and where the most new job opportunities are. The state has a rapidly growing proportion of Asian Americans, specifically Indian and Vietnamese; these groups nearly quintupled and tripled, respectively, between 1990 and 2002, as people arrived in the state for new jobs in the growing economy. Recent estimates suggest that the state's Asian-American population has increased significantly since 2000. During the 1980s Hmong refugees from communist rule in Laos immigrated to North Carolina. They now number 12,000 in the state. Settled first, the coastal region attracted primarily English immigrants of the early migrations, including indentured servants transported to the colonies and descendants of English who migrated from Virginia. In addition, there were waves of Protestant European immigration, including the British, Irish, French Huguenots, and Swiss-Germans who settled New Bern. A concentration of Welsh (usually included with others from Britain and Ireland) settled east of present Fayetteville in the eighteenth century. North Carolinians of Scots-Irish, Scottish and English ancestry are spread across the state. Historically Scots–Irish and Northern English settled mostly in the Piedmont and backcountry. They were the last and most numerous of the immigrant groups from the Britain and Ireland before the Revolution, and settled throughout the Appalachian South, where they could continue their own culture. The Scots-Irish were fiercely independent and mostly yeoman farmers. Since 1990 the state has seen an increase in the number of Hispanics/Latinos. Once chiefly employed as migrant labor, Hispanic residents of the 1990s and early 2000s have been attracted to low-skilled jobs in the state. As a result, growing numbers of Hispanic immigrants are settling in North Carolina, mainly from Mexico, Central America, and the Dominican Republic. North Carolina, like other Southern states, has traditionally been overwhelmingly Protestant. By the late nineteenth century, the largest Protestant denomination was the Southern Baptists. However, the rapid influx of northerners and immigrants from Latin America is steadily increasing the number of Roman Catholics and Jews in the state. Yet, the numerical dominance of the Baptist Church remains strong. While North Carolina is a southern state, it has escaped many of the problems faced by other states in the region. In the mid-twentieth century it had a vibrant economy, based mainly upon manufacturing, which brought an above average population growth. The industrial sector was the largest in the region and one of the largest in the nation. The state's public school system, supported by the state since 1933, is below national levels. These figures have shown improvement since the 1990s, though state expenditures for education remain relatively low. The first state university in the United States was the University of North Carolina, which opened its doors in 1795 in Chapel Hill. A number of the state's universities are of national standing. One of the nation's largest community college systems is in North Carolina, comprised of more than fifty institutions. Many of the state's private colleges and universities were established by various Protestant denominations. North Carolina has a decidedly southern character and charm, while it is a place of progress and opportunity. The beauty of its landscape, its economic prosperity, and stable government provide a secure environment and way of life for its citizens. ↑ North Carolina Climate and Geography. NC Kids Page. North Carolina Department of the Secretary of State (May 8, 2006). Retrieved February 16, 2012. ↑ 3.0 3.1 Median Household Income, from U.S. Census Bureau (from 2007 American Community Survey, U.S. Census Bureau. Retrieved April 9, 2009. ↑ David G. Moore, Robin A. Beck, Jr., and Christopher B. Rodning. "Joara and Fort San Juan: culture contact at the edge of the world," Antiquity 78 (229) (March 2004). Retrieved October 18, 2008. ↑ Constance E. Richards. "Contact and Conflict" American Archaeologist (Spring 2008). Retrieved October 18, 2008. ↑ John Hope Franklin. 1941 (reprint, 1991). Free Negroes of North Carolina, 1789-1860. (Chapel Hill: University of North Carolina Press). ↑ U.S. Bureau of Economic Analysis. October 26, 2006. Gross State Product Retrieved October 18, 2008. ↑ U.S. Bureau of Economic Analysis. September 2006. Per Capita Personal Income Retrieved October 18, 2008. ↑ NC Department of Commerce. Nurture Wine and Grape Industry Retrieved October 18, 2008. ↑ North Carolina Alcoholic Beverage Control Commission. Legislative Updates Retrieved October 18, 2008. ↑ North Carolina General Assembly. Medicine and Allied Occupations (NC § 90‑94) / (NC § 90‑95 subs 4) Retrieved October 18, 2008. ↑ U.S. Census Bureau. North Carolina QuickFacts Retrieved October 18, 2008. ↑ Alfred W. Stuart and Laura Baum. Spring 1995. Contemporary Migration in North Carolina North Carolina Museum of History. Retrieved October 18, 2008. ↑ The Center for New North Carolinians. Ethnic Groups in North Carolina Retrieved October 18, 2008. ↑ North Carolina Department of Administration. Tribes and Organizations Retrieved October 18, 2008. ↑ U.S. Census Bureau. July 2004. State Rankings—Statistical Abstract of the United States Retrieved October 18, 2008. Crow, Jeffrey J., and Larry E. Tise. 1979. Writing North Carolina history. Chapel Hill: University of North Carolina Press. Fischer, David Hackett. 1989. Albion's Seed: Four British Folkways in America. New York: Oxford University Press. Kersey, Marianne M., and Ran Coble. 1989. North Carolina focus: an anthology on state government, politics, and policy. Raleigh, NC: North Carolina Center for Public Policy Research. Lefler, Hugh Talmage. 1956. North Carolina History told by contemporaries. Chapel Hill: University of North Carolina Press. North Carolina, and North Carolina Historical Commission. 1917. North Carolina manual. Raleigh: North Carolina Historical Commission.